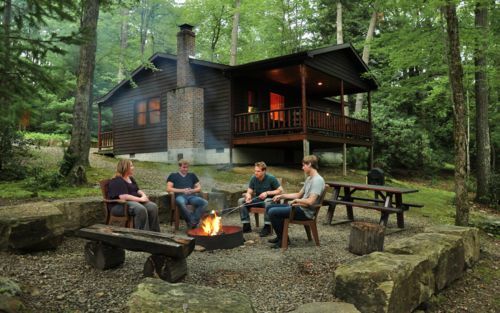 Tucked away in the peaceful woodlands of Cook Forest State Park lies Black Bear Cabins: a quaint collection of vacation rental cabins located close to Cooksburg, Pennsylvania. 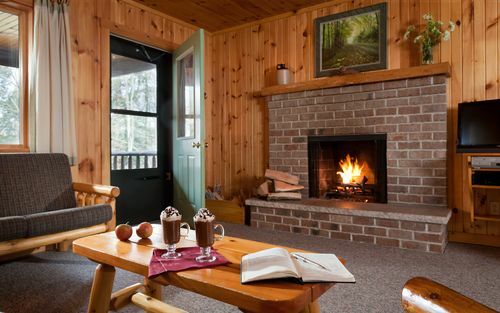 Log cabins are our portal to the outdoors lifestyle, and Black Bear Cabins offers the opportunity to explore the wildly changing seasons of rural northeast America. The attractive rustic exterior is a pleasant sight at the end of the day. 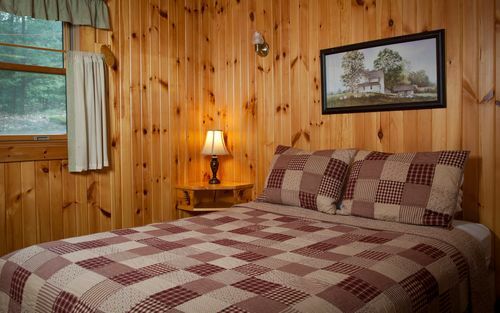 The cabin appears very inviting, almost asking you to come inside to relax. 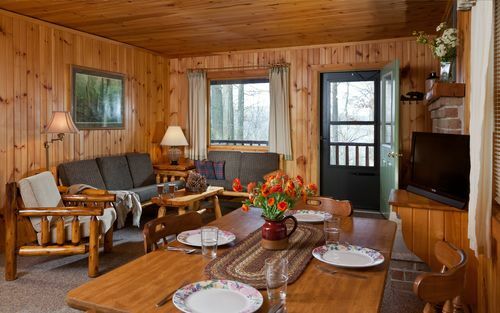 A log cabin requires only a simple living space; this cabin has a welcoming lounge that is open to the dining area. You enter the cabin directly into the living room. This comfortable space is effortlessly heated with a fireplace and low ceiling to keep the heat close. 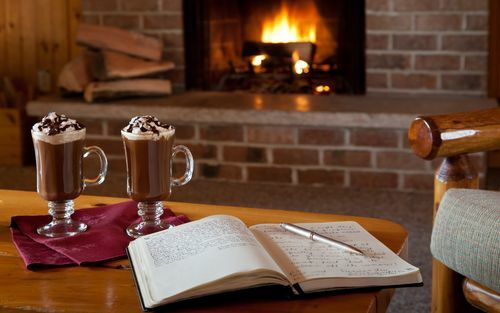 Sitting by a roaring fire is the perfect way to enjoy an evening in a log cabin. 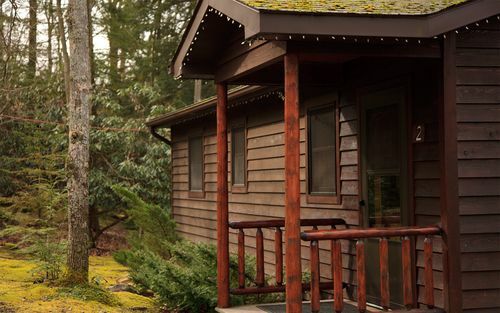 This image captures the essence of a wooden retreat: a time for quiet reflection and simple pleasures. This cabin's bedroom comfortably houses a queen-sized bed. It isn't the largest room, but when getting away to the countryside, a bedroom is often just a place to lay your head at the end of the day. 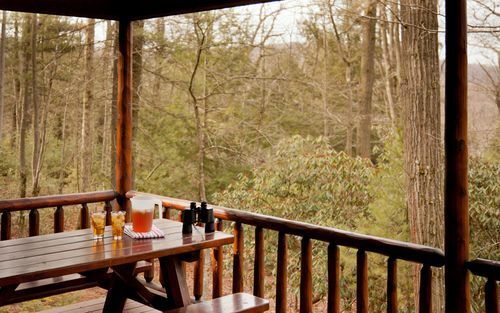 A picnic table adorns the covered deck area, giving you space for outdoor dining, drinks or even a little bird-watching. As day turns into night, this is where you will find me: around the fire pit, enjoying the company of my friends. 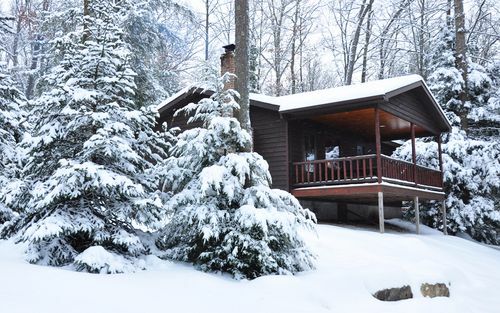 While many of us like to get away during the summer months, a log cabin in the winter can be a magical experience. 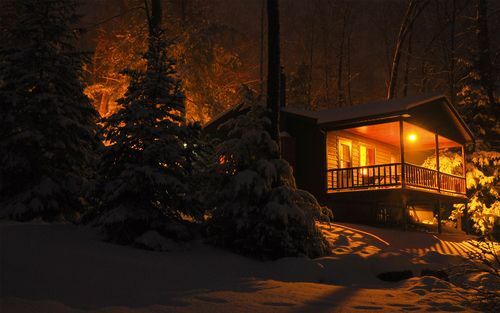 The snow creates an idyllic image, and the crisp air makes the warm cabin even more inviting. 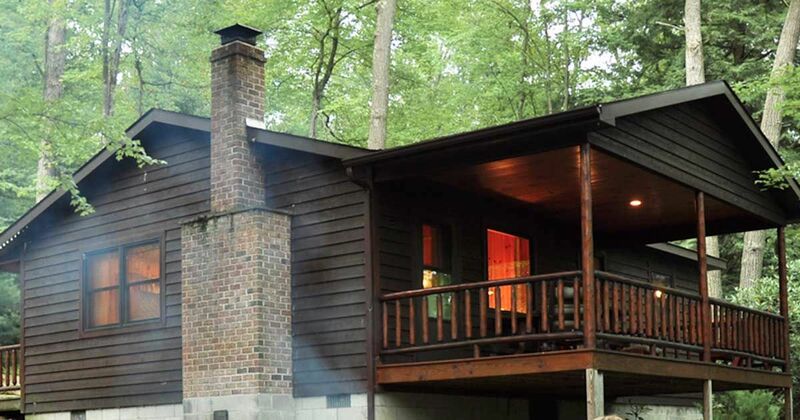 This simple cabin offers everything you need to explore Cook Forest State Park. Does it have everything you need for a weekend getaway? Talk to us on Facebook, and don't forget to SHARE this tour with your friends.